This venue was added to our database on April 15, 2002, and the venue's information was last updated 16 years ago. burque.info is responsible for keeping this venue's information up to date. This page has been viewed 3495 time(s). 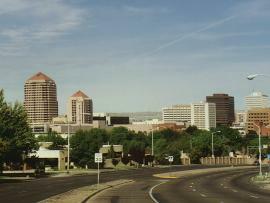 Downtown Albuquerque - this is usually considered the "bar district" which is between 1st and 6th streets, and includes Central, Gold and sometimes other side streets. Lots of good theaters, bars, restaurants and clubs ... El Rey, Golden West, Launchpad, Downtown Distillery, Anodyne, Brewsters, Kimo, Raw, Sauce, O.P.M, Moonlight Lounge, Sunshine Theater and others! © copyright 1993-2007 by fearstudios.com ( 186203269+111ms ). All Rights Reserved. Report a bug or make a suggestion.